Blanchard rotary surface grinding features large stock removal rates on flat surfaces. Ferrous materials are held on a magnetic chuck while the opposite surface is ground. One side is ground at a time. Non-ferrous materials can also be ground, but require special work holding arrangements. The Blanchard will leave its trademark cross-hatched surface finish pattern, typically within a 32-125 RMS range, though higher finishes are possible. Ferrous or non-ferrous metals, annealed or hardened up to 62 RC. Up to a 82" diagonal on Blanchard machines and 72" length on surface grinding. Machining costs and turnaround time can be reduced by simultaneously Blanchard grinding multiple parts. 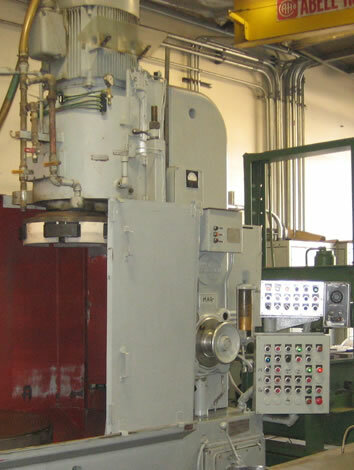 Blanchard grinding is often faster and more economical than milling because of fast set ups. Multiple part grinding of large loads provides uniform part-to-part thickness tolerances and surface finishes at a lower unit cost.